To setup your new Smart Security Light, please make sure it’s successfully installed, and that status LED on the bottom left-hand side of your light is flashing red. When you open the Kuna app for the first time, you will see the login page. Click the “Get Started” button to create a new Kuna account. Once you click Get Started, you’ll be prompted to add your name, your email address, and to choose a password for your Kuna account. As soon as you have re-entered your password, click Next on the top right-hand corner of the screen. Then confirm that you would like to use that email address for your Kuna account, and you’ll be all set. Your Kuna account has now been created, and you can skip to Step 4! Once you click Log In, you’ll be prompted to log in using your Kuna account email address and password. 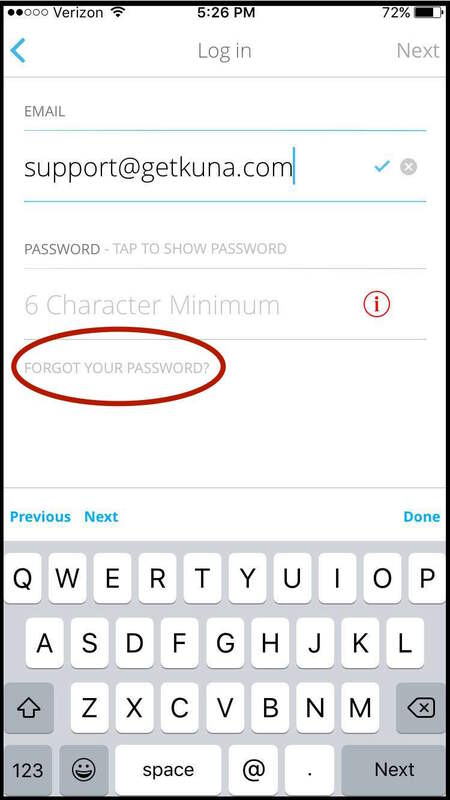 If you don’t remember your password, click the Forgot Your Password? option to reset your Kuna account password. After entering your Kuna account email address and password, click NEXT on the top right-hand corner of your screen. You’re now signed into your Kuna account! If you already have shared access or a paired device, you will see a thumbnail of all the devices you currently have access to – like the screen shot below. In this case, you’ll click the Device Plus button on the top, right-hand side of the screen. Once you have clicked either the Device Plus button or the Add Device button, you will be prompted to choose the type of device you would like to pair with your account. In this walkthrough, we’ll be setting up a Smart Security Light, so choose that option by tapping on the picture of the Smart Security Light. If there are multiple Smart Security Lights in the area, like in the screen shot below, the mobile app will tell you which one is the closest. The one that you are pairing should have the strongest Bluetooth signal, so make sure that you’re standing close to it. If the app displays multiple devices, the one you’re setting up should have the strongest Bluetooth signal. Make sure you’re standing close to it. Once you have identified the closest Smart Security Light, tap that device’s name to continue the setup process. If there is only one device in the area, then you can choose that one. In the screen shot below, we will choose New Device 1. In the screen shot below, we will choose the name “Front Door” for our device. Now that you have chosen a name for your Smart Security Light, it’s time to connect it to your home’s Wi-Fi network. The mobile app displays all of the Wi-Fi networks that it is able to find in the area. Make sure that your home’s Wi-Fi network displays at least two bars in the mobile app. If your Wi-Fi network shows less than two bars, or is not displayed in this section, move your wireless router closer to your Smart Security Light. Once you have located your home’s Wi-Fi network, tap on the network name to select it and move to the next section. In the screen shot below, we will select the Wi-Fi network “kuna”. Once you have selected the network for your Smart Security Light, click into the WiFi password section and enter your home network’s WiFi password. We suggest using the Show Password function, to ensure that your password is entered correctly. Your Smart Security Light will now connect to your home’s WiFi network! Your Smart Security Light will use the timezone to determine sunrise and sunset times for your location. The mobile app will automatically suggest the timezone your mobile device is set to, but you can also select a different timezone. In the screen shot below, we’ll choose the timezone “America/Los Angeles”. After you set your timezone, we’ll choose the city that your Smart Security Light is setup in. The city information is used for the sunrise and sunset times for your light schedule. The Kuna app uses your approximate location to make your light schedule more accurate. You DO NOT need to provide your full address. If you have setup any previous devices, the mobile app will suggest a city for you. Otherwise, you can click “Enter new location” to choose a new or different city for your device. Your device can play a pre-recorded message when motion is detected, as a way to greet or alert visitors. To use the default Chime sound, select “Yes – Use Defaults”. To change the sound, or turn the sound off, select “No – Change Greetings”. Then, select a new sound, or “Off”, and tap the arrow in the top lefthand corner to go back to the setup process. The mobile app will suggest using the default settings – turning the light on at dusk and off at dawn. If you would like to keep the default settings, click “Yes – Finish Setup”. If you would like to change the default settings, click “No – Change light schedule”. Once you click “Yes – Finish setup”, you’re done and ready to start using your new Smart Security Light! If you need to set up any other devices, simply click the “Set up more devices” button.